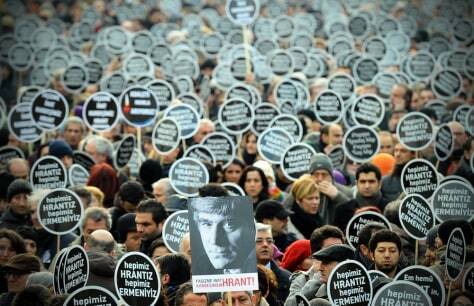 Thousands of Turkish people march to the offices of Armenian newspaper "Agos" during a commemoration ceremony for slain journalist Hrant Dink, in Istanbul, on Jan. 19, 2012. Dink, one of the most prominent voices of Turkey's shrinking Armenian community, was killed by a gunman on Jan. 19, 2007. The 52-year-old Dink, a prominent member of Turkey's tiny Armenian community, campaigned for reconciliation but was hated by Turkish nationalists for calling the World War I massacres of Armenians a genocide.